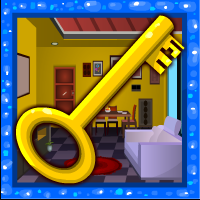 G4E Room Escape 11 is another point & click escape game developed by Games4Escape. In this game, you have entered a room, but unfortunately the door got closed. You have to find the key to get out of this room with the help of useful objects to interact with and by solving puzzles. Good luck and have fun! 3 batteries and a mag. glass (maybe). House Owner, not sure if there was a clue, but I didn't see one. Magnify glass for pic. with flowers, yellow dots at bottom right.